A costumed Flight of the Bikes, explosive dance aerobics, a choreographed dance flash mob and a Bicycle Ballet turn the Flyover into a stage for colourful performance in the second Takeover of the summer. Acrojou, MoveMe, Strictly Cycling, Sustrans and more are part of the day’s’ events which includes workshops before and during the event to encourage people to take part in performances. Acrojou bring their electric performance Frantic to The Flyover. Choreographed around a wheel, Frantic is about the busyness of modern lives; the reality of a running mind and one man’s thirst for espace. Conceived and directed by Jeni Barnard, and performed by Barney White and Gabrielle Cook, Frantic is about love, freedom, blood, sweat and rain storms. It’s a rich visual performance that tells a story through dance and movement. Meanwhile, MoveMe is an interactive dance event. Low pressure but high fun, MoveMe is a dance class crossed with a flashmob with a little bit of party thrown in. Learning moves alongside professional dancers it’s for all ages and abilities. There’s a workshop at the World Museum from 10:15 am for all ages to practice and learn moves. There are two performances at the Flyover at 1pm and 4.15pm. 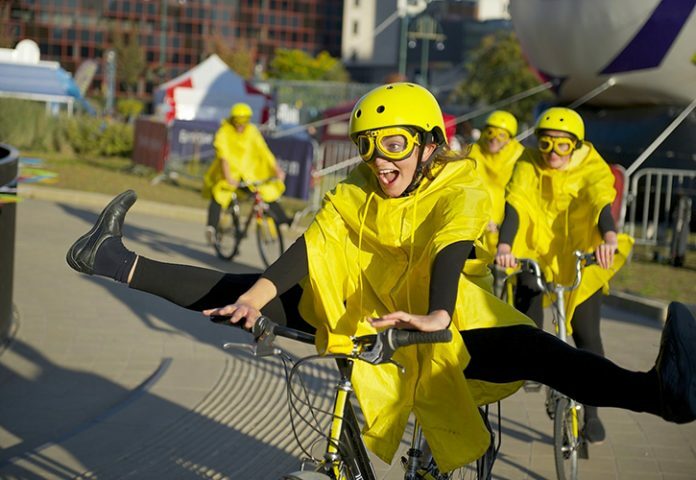 Strictly Cycling is an improvisational, visual performance & ‘cycle-dance’ inspired by flash mobs, dada-ism, everyday cycling experiences & the great British weather in a bicycle ballet. After a community workshop in Everton from midday until 2pm, five professional performers and their local participants in bright yellow costumes cycle or wheel their bikes. They take over The Flyover creating epic human/bike sculptures; parking their bikes in the hands of passers-by & battling in slo-motion races, celebrating cycling, life & yellowness. Part choreographed and part improvised, this is a roving performance interspersed with short, static vignettes. A third workshop organised by Sustrans begins at 11am in the Breckfield Centre, where participants of all ages can make wings for a costumed Flight of the Bikes ride which will start from the Breckfield Centre at 1pm and journey to the Flyover. The Flyover Takeover Festival is about asking a single question: What do you want the Flyover to be? Over six days from June to September, a summer festival welcomes artists, musicians, dancers, walkers, rider and food makers for a festival of culture and community on the urban flyover. Organised by We Make Places and Friends of the Flyover with funding from Arts Council England, Paul Hamlyn Foundation, Granada Foundation, Sustrans and others, the programme is the next stage in the exploration of The Flyover, which held its last festival two summers ago. Kate Stewart from We Make Places and Friends of the Flyover said: “Our second takeover is about encouraging people of all ages to come to The Flyover and see amazing performance or take part in our workshops to be part of the performances, whether it’s a bicycle ballet or a costumed ride or even a dance. The Flyover is for everyone and that’s what we want Sunday to be”.